Obituary – Leighan, Curtis W. « Perry High School Alumni Association, Inc.
Obituary – Leighan, Curtis W.
Curtis W. Leighan, 103, of Cheyenne died Nov. 27 at Cheyenne Regional Medical Center. He was born June 29, 1908, in Perry, Okla., a son to Samuel W. and Helen (McCain) Leighan. He received his schooling in Perry and then worked in various locations, including Oklahoma, Kansas and Tennessee before settling in Cheyenne in the early 1950s. He was an electronic technician for Continental Oil Company until his retirement. Mr. Curtis married Elnora Rank on June 26, 1959, in Laramie. She passed away Aug. 14, 2011. He was a member of the International Order of the Odd Fellows for more than 60 years. He served as both local and state Grand Master. He enjoyed woodworking and for a very long time he made doll furniture and gave it to the fire department to give to families who were the victims of fire. He also enjoyed stone work. 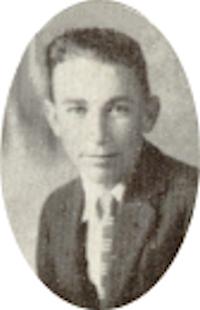 He is survived by two sons, Wayne D. Leighan of Madison, Va., Earl S. Leighan of Cheyenne; a daughter, Velma Lea Hartley of Haines, Ore.; stepson, Russell McDonald of Westminster, Colo.; and stepdaughter, Elsie Thomas of Cheyenne. He was preceded in death by his wife, Elnora; his parents; a brother, Gilbert Leighan; and four sisters, Edith Leighan, Marie Luellyn, Viola Smith and Margaret Conner.